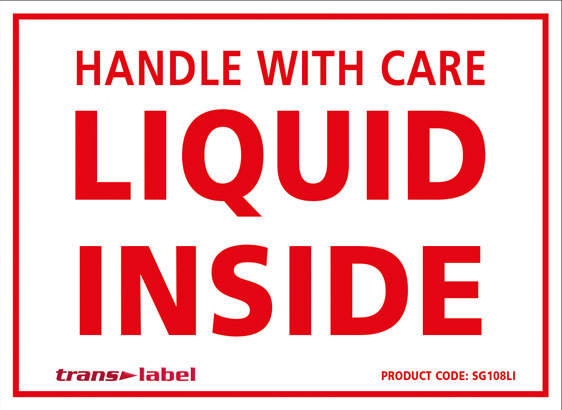 Make these durable “LIQUID INSIDE” labels part of your protective packaging when mailing or storing containers of fluid, such as bottles of wine or spirits, health and beauty products or house and garden goods. With strong glue and non-fade high definition colour, these self adhesive sticky labels are the perfect way to warn handlers of the need for care and are the quick and efficient way to mark up items. Our “liquid inside” labels are supplied on peelable rolls so are ideal for high-volume mail rooms as they can also be used in a label dispenser for extra speed. Our liquid inside labels measure 108mm wide x 79mm high. These warning labels are printed in bright red on a white background and are supplied in rolls of 500. With a high tack adhesive that sticks well to clean dry packing materials including plastic, cardboard, stretch film, glass, metal, wood and polythene, they offer you versatile product or mailing labels. They carry the bold text LIQUID INSIDE under the words HANDLE WITH CARE, underlining the importance of the message to handlers. Made of tough, strong paper, our “liquid inside” labels are easy to peel and store neatly on the roll, which can be used with our automatic label dispenser.